Born in 1895 in Huntington, graduated from Huntington High School in 1911. His ancestors owned a Brewery in Connecticut; his father owned a carriage shop. Received a degree in Engineering from Cornell University in 1916. 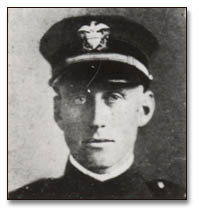 Was a U. S. Naval Aviator during World War I. Worked for the Loening Aircraft Company of Long Island City as General Manager 1920-29. 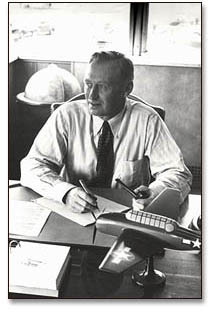 Left Loening in 1929, with two other engineers to form the Grumman Aircraft Company, using $32,000 of combined capital. Grumman served as the company’s first president and guided it through its formative and wartime years. Their first factory was in a converted garage in Baldwin where they repaired damaged airplanes and built aluminum truck bodies. Received their first naval contract in 1930 for aircraft floats. Moved the company to a hangar at Curtiss Field, Valley Stream in 1931 where they built biplane fighters for the Navy. These were the first naval aircraft with retractable landing gear. Expanding production led to Grumman moving to larger quarters at Fairchild Field, Farmingdale in 1932 where the company continued production of fighter and utility planes for the Navy. -Rapidly increasing production led to Grumman’s final move, to a new flying field and factory at Bethpage in 1936. -He possessed two great mental assets: one was the ability to go directly to the core of a problem; the other was the ability to visualize the solutions to problems. -During World War II Grumman aircraft dominated U. S. Naval Aviation Forces and destroyed 2/3 of all Japanese aircraft. Grumman Wildcats were the first naval aircraft with folding wings and Hellcats had the highest "kill ratio" of any aircraft in history. -During the war Grumman also set aircraft production records which have never been equaled and they won the Navy "E" award for production efficiency five years in a row. -Grumman believed increased productivity was obtained through a happy workforce. He created this by hiring local people, providing satisfactory working conditions, recreational facilities, good benefits, profit sharing and the ability to consult management directly. Grumman has never been unionized. -Grumman’s workforce peaked at over 20,000 during World War II, and again in the mid 1960s. -He was described as shy, quiet, informal and unassuming. He disliked cities, publicity and most social functions. He always shared a small office at Grumman’s plant, and he never wanted the company to grow too large because it might lose its family spirit. -Lived in Plandome with his wife and four children. -Remained as Chairman of the Board of Grumman until 1966. Thus he guided the company into the jet age in the 1950s and finally the Space Age in the 1960s. He remained as a Director until 1972. -Many awards and honorary degrees were bestowed upon him during his long aviation career. -Died in 1982 at age 87.